As always it is a pleasure to discover a new-to-me author. I read so voraciously that I run out of authors quickly and have to fill the time until my favorites put out a new book. I used to read everything but as I get older I read in genre because I don't want to be sad when I read. Life is hard enough without entering into someone else's pain. Hence my extreme distaste for the au courant theme of tragedy fiction. Something truly horrendous happens and then we watch everyone fall apart and limpingly patch themselves back together. Sometimes they just stay devastated (as of course you would) as the book grinds on to its dreary end. I avoid books with blurbs like "heart-wrenching" and "soulful". Which is why I like a good murder mystery. I prefer ones where the victim is already dead and please, no serial or psychotic killers. Death Pans Out by Ashna Graves is set in Eastern Washington, a land of dry, seemingly empty spaces. Jeneva Leopold retreats to a cabin on her uncle's mining claim to recover from her own disaster (which we are not asked to enter into). As Jeneva regains health and hope she is confronted with two mysteries: her uncle's decade-old disappearance and the death of a young miner. 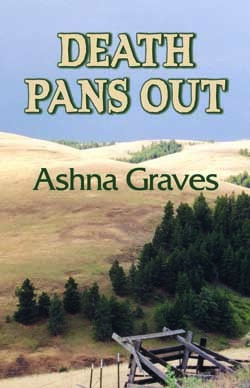 Ms. Graves skillfully evokes the pine-scented desert and populates it with interesting, ambiguous characters. Along the way we learn the history of this part of Eastern Washington and how traditional land uses such as mining, and ranching must adapt to changing values. The mystery and bad guys weren't easy to figure out but made sense at the reveal.